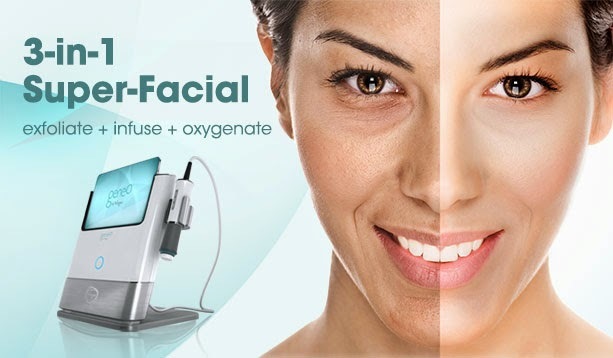 If you haven't heard of an OxyGeneo before, it's a 14-minute skin revitalizing treatment that offers the benefits of microdermabrasion, chemical peels and oxygen facials all together in one easy, quick and painless procedure! The treatment takes its inspiration from natural hot springs known for inducing skin oxygenation - by simulating the effect, it triggers a body response that sends oxygen to the treated area. Basically how it works is by first exfoliating the upper skin alyer to remove dead cells and prepare the skin to receive active nutrients, then it cleanses the skin while infusing nutrient-rich formulas and finally it produces countless minute CO2 bubbles which gently burst on the skin surface inducing a physiological response that sends oxygen-rich blood to the treated area which results in optimal absorption of the formula. NeoRevive - with active ingredients: Palmitoyl Tripeptide-5, Glycerine, Hyaluronic Acid and Retinol which provides optimal skin rejuvenation and anti-aging to smooth the appearance of fine lines & wrinkles and revitalize dull complexion. NeoBright - which can be used on any skin tone - with active ingredients: Magnesium Ascorbly Phosphate, Kojic Acid and Retinol which provides optimal skin lightening, nourishment and rejuvenation for powerful but gentle skin lightening while reducing skin pigmentation and sun damage. Both formulas also offer natural facial skin oxygenation, uniform & non-irritation exfoliation, hydration and nourishment that is simple, safe and pleasant with long term advantages. What's really nice about the treatment formulas is that they come individually packaged meaning you are getting a fresh, new dose each time! I gave it a try and since my skin is already pretty even toned they used the NeoRevive formula. The treatment itself is very relaxing, almost like getting a nice long facial massage. I understand that if you have sensitive skin it can feel warm on your skin, but I didn't have that issue. The oxygenating part of it tickles a bit with the bubbles popping all over your skin - but overall it was very pleasant and I did appreciate this an an alternative to microdermabrasion because there was none of the sucking action going on which I should probably be avoiding as I get older and start to lose skin elasticity - the OxyGeneo gives me all the benefits of micro without the downside! After the treatment my skin looked brighter and felt smoother - the other upside to this over micro - no post-treatment breakouts! Treatment cost ranges from $125-$200 per treatment and is available at select medical spas and clinics in Canada including Glow Medi Spa in Toronto. Check out www.geneo.ca for other locations and some pretty amazing before and after photos!